Between 1897-1921, The International Studio was the U.S. edition of the British fine and decorative arts journal The Studio, and was produced jointly in New York and London. Although the focus of The International Studio was art from an American perspective, for many years it replicated a percentage of material from the British edition. 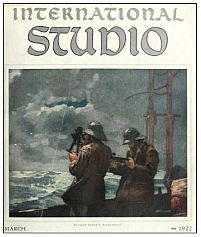 In 1922 The International Studio was acquired by International Studio Inc. and henceforth published exclusively in New York. In September 1931 it was absorbed into The Connoisseur. Editors of The International Studio were Charles Holmes (1868-1936), from 1897 to 1920; G.C. Eglington, from 1920 to 1922; Peyton Boswell (1879-1936), from 1922 to 1925; W.B. McCormick, from 1925 to 1928; and H.J. Whigham (1869-1954), from 1928 to 1931.